Born in Milan, Boltraffio, sometimes called Giovanni Antonio Beltraffio, was a painter of the High Renaissance said to work with Leonardo da Vinci (1452 – 1519). This is partially confirmed by the biographer, Giorgio Vasari (1511 – 1574) and also from Leonardo’s note of a Gian Antonio working in his studio. 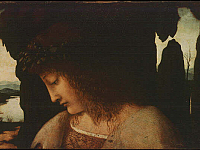 There is also the evidence that Boltraffio painted closely to the style of da Vinci at the time. His pieces showing the influence of da Vinci include his Madonna and Child, among his other depictions of the Virgin and child, as well as in his portrait work. They clearly show the use of a common da Vinci trait, the smoky blend of color and tone to create depth in the image, a method called Sfumato. Boltraffio’s best known work is a piece he collaborated on with another pupil of Leonardo’s, Marco d’Oggiono (1470 – 1549), titled The Resurrection of Christ. He worked in Bologna under the patronage of the Casio family, executing several well regarded portraits of them. This included the piece now in the Uffizi Gallery, The Poet Casio, which was Girolamo Casio, whom paid tribute to Boltraffio in some of his sonnets. The artist also expanded his influences while in Milan, taking in the work of Bartolomeo Suardi, called Bramantino (1455 – 1535) and also another follower of da Vinci, Andrea Solari (1460 – 1524).